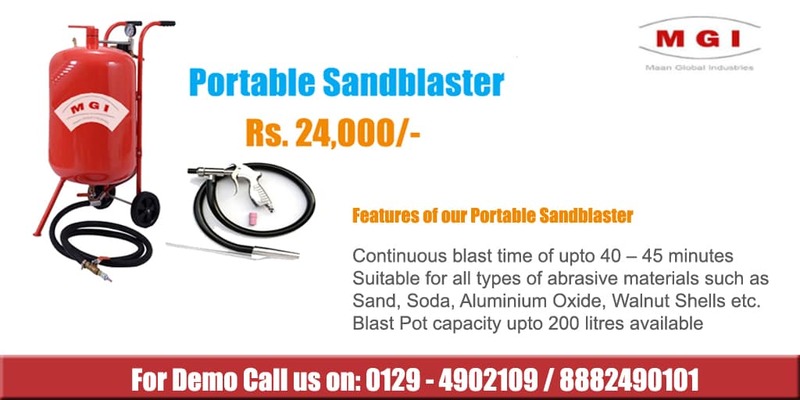 Leading manufacturers of Sandblasting machine, Portable Sandblaster and Shot Blasting Machine in India catering to various industrial and engineering organizations across the country. Our customers include Escorts Group, JBM Group, Lakhani Industries, Honda Motors and many other leading small and mid sized companies that require highly reliable and affordable sand blasting machine as well shot blasting machine. We also provide abrasives of various kinds that are used for Sandblasting and Shot blasting purposes at whole sale prices. With a world class team of technicians, experienced managers and product designers, we have grown into a full-fledged corporation catering to the needs of the leading companies on the market. 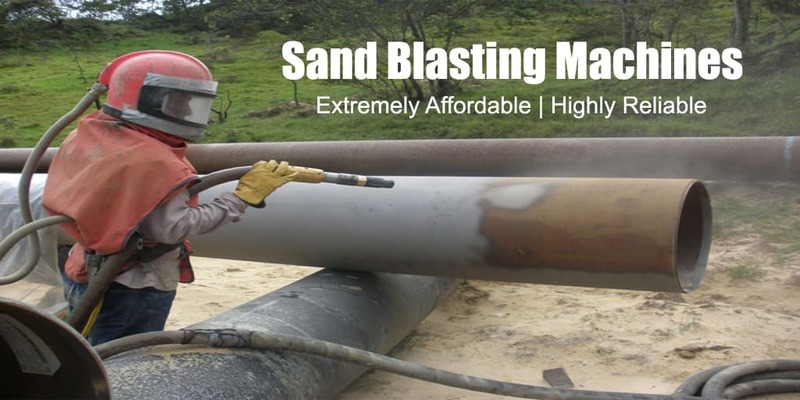 Having a large pool of talented product designers and technicians we are able to come up with products for the blasting industry that are extremely affordable and highly reliable. With an experience of over 2 decades in the blasting industry we are among the leading manufacturers of sandblasting machine and shot blasting machine in India. We have two plants, a full-fledged Software Technology Center for product innovation and we organize student visits at our plants on a regular basis. Sand blasting Machine or Shot blasting machine can be your best investment when it comes to cleaning of various metal surfaces or floors as it saves times, labor and money compared to the traditional cleaning techniques or equipment. Shot blasting process is highly effective in removing burrs on cast iron parts and forged iron components. If you already have a shot blasting machine then you can learn how to improve shot blasting process for better efficiency and results. 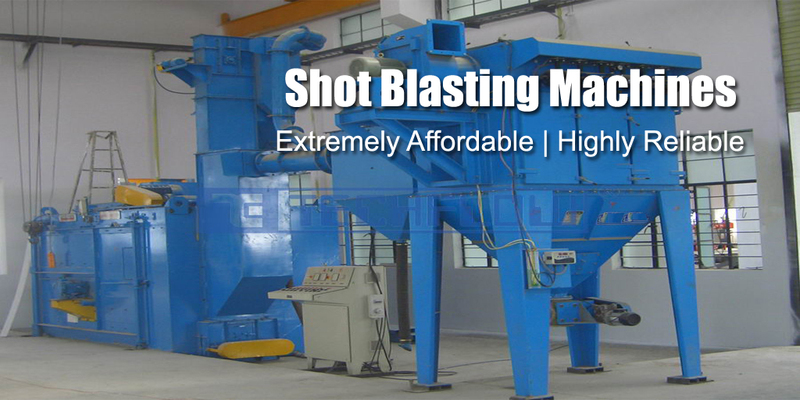 Here’s a very useful guide to understand the characteristics of shot blasting process. Come explore with us how a Portable Sand blasting machine or a Shot Blasting machine can help you cut costs and save time by preparing the surface for painting and powder coating. All our sand blasting machine and shot blasting machine are manufactured in house at our plants and sold by us directly so that we can offer you the best prices on the market. Our customers and our passion to create the long lasting products have made us the leading manufacturers of Portable Sand Blasting Machine and Shot Blasting Machine in India. 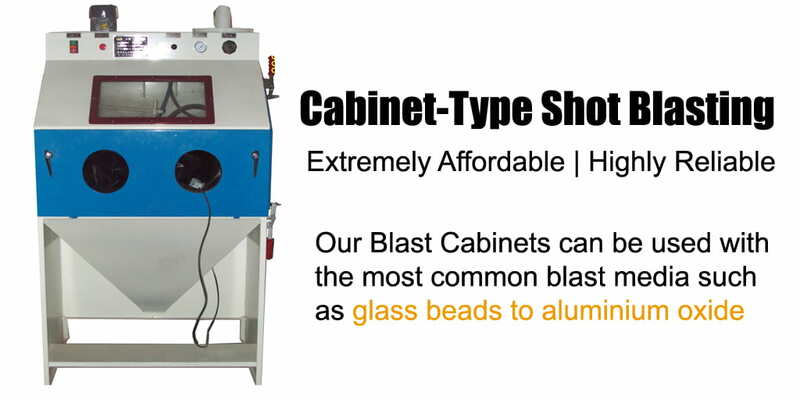 We are among the leading manufacturers of Shot Blasting Machines in India for over a decade and provide various models of shot blasting machines for different applications such as Portable Sandblasting machine , Tumb Type Shot Blasting Machine, Cabinet Type shot blasting machine, Cabinet Type Sandblasting Machine, Stone Shot Blasting Machine, Spinner Hanger Type Shot Blasting Machine, Table Type Shot Blasting Machine , Blast Room and many other models. We also provide Blasting Abrasives like Aluminum Oxide, Cut Wire Shots, Steel Grits and Steel Shots etc. Also offering Shot Blasting Machine Spares, Sand Blasting Hood and many more. All our products are corrosion resistant with accurate dimension, fine finish, high strength, not required much maintenance and long life. We also provide Sand Blasting Services which is known for reliability, long serviceability and cost-effectiveness. The above offered products are in a variety of specifications to cope up with the requirements of patrons. We have a large customer base whom we provide our cheap shot blasting machine in Gurgaon, Karnal, Panipat, Rohtak, Ambala, Hisar, Faridabad, Mumbai, Pune, Ghaziabad, Noida, Bikaner, Jodhpur, Ajmer, Jaipur, Udaipur, Kota, Bhilwara, Alwar, Bareilly, Moradabad, Saharanpur, Agra, Meerut, Aligarh, Allahabad, Banaras, Mathura, Jhansi, Punjab, Chandigarh, Jalandhar, Amritsar, Ludhiana, Bathinda, Pathankot, Patiala, Hoshiarpur, Shimla, Dharamshala, Uttrakhand, Dehradun, Haridwar, Roorkee, Rudrapur, Rishikesh, Nainital, Assam, Guwahati, Agartala, Shillong, Bihar, Patna, Gaya, Bhagalpur, Muzaffarpur, Jharkhand, Jamshedpur, Dhanbad, Ranchi, and many more cities. We are also the suppliers of all types of New & Old Shot Blasting Machines and all kinds of Spares of any type of Shot & Sand Blasting Machine. In an age where superiority is determined by balancing qualities of design, technology and prompt services, MGI leads the way combining its resources. Efficiency and superior quality maintained has been the cornerstone in providing competitive services, machinery and support to the blasting and painting industry. We take pride in every aspect of our manufacturing process to provide the professional touch in our business. This allows us to be responsive to customer demands in a dynamic business environment today. We actively work with our customers for the optimal solution. We believe in supplying the highest quality machines, at competitive prices, that will exceed our customer’s expectations. Maan Global Industries stays committed to the core values of excellence and customer satisfaction and endeavors to add to the product line-up with better precision and productivity in the years ahead. Entire Range of Spray Guns Available.